Organic. Pasteurised. Non GM. 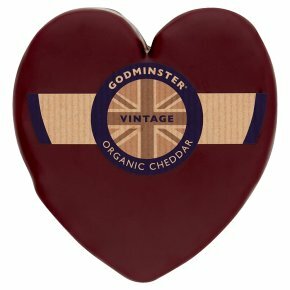 Suitable for vegetarians.Godminster Vintage Organic Cheddar is made in the heart of the Somerset countryside and matured for up to 12 months. It is deliciously creamy & full of flavour, a smooth, rich cheese that is suitable for vegetarians. This gorgeous and distinctive truckle is wonderful on a cheeseboard, as an ingredient in a whole host of recipes, and perfect in a tasty sandwich. Godminster's multi-award-winning Oak-Smoked Vintage Organic Cheddar is a real crowd-pleaser and a cheese for the whole family to enjoy.